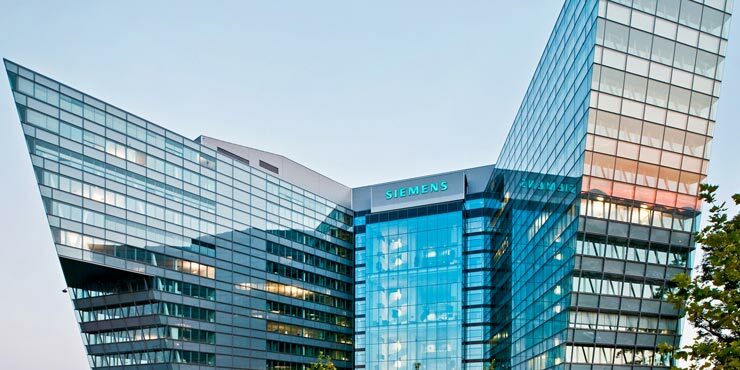 The architectural form of the Siemens Tower reflects an inviting, open gesture in the direction of the main entrance. This building features particularly sustainable construction with ultra-modern and highly-efficient building services. 120 pillars, which are one metre in diameter and driven 30 metres into the ground, use geothermal energy to heat the building in summer and cool it in winter. In addition, a solar collector area of 200 m² for generating hot water, and heat exchangers for recovering heat from the outgoing air, have earned Siemens City its status as an EU-recognised Green Building. The basins in the restrooms are equipped with GROHE Eurodisc fittings. Using water-saving GROHE EcoJoy® technology, the flow of water through the faucet is reduced by up to 50%.